Citation Information: J Clin Invest. 2007;117(12):3988-4002. https://doi.org/10.1172/JCI32533. 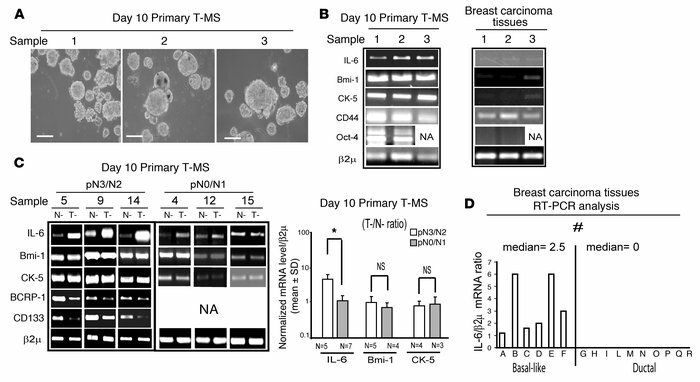 IL-6 mRNA is expressed in MS and in basal-like breast carcinoma tissues. (A) Phase-contrast microscopy of day 10 primary T-MS generated from samples listed in Table 1. Scale bars: 100 μm. (B) RT-PCR analysis of IL-6, Bmi-1, CK-5, CD44, Oct-4, and β2μ mRNA in T-MS and in tumor tissues from which T-MS had been obtained. (C) Day 10 primary N-MS and T-MS were obtained from the same patient (see Table 1). RT-PCR analysis of IL-6, Bmi-1, CK-5, BCRP-1, and CD133 and quantitation of IL-6, Bmi-1, and CK-5 mRNA, first normalized onto β2μ mRNA and then expressed as a ratio of N-MS to T-MS. *P = 0.031, Mann-Whitney test. NA, not available. (D) Breast carcinoma tissues from patients affected by basal-like or ductal breast carcinoma (see Table 2) were subjected to RT-PCR analysis. Shown is the ratio of IL-6 to β2μ mRNA. #P = 0.001, Mann-Whitney test.